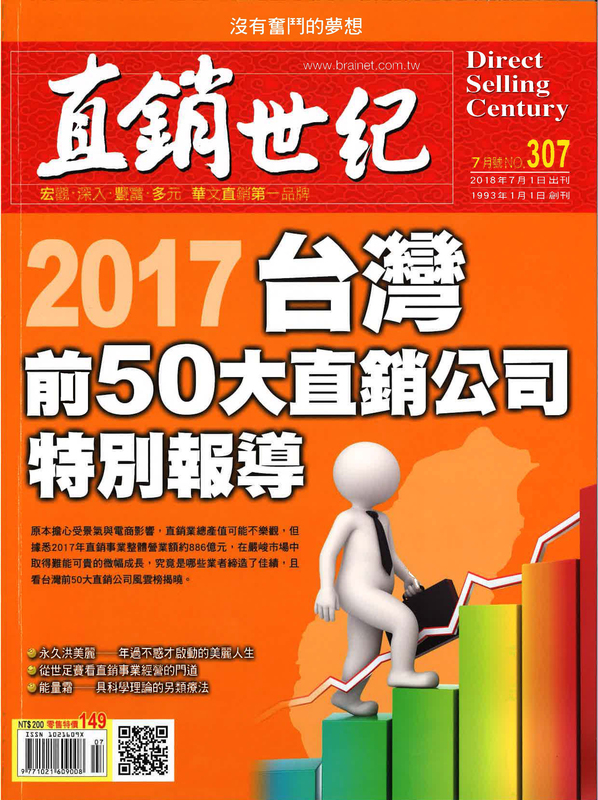 “Direct Sales Century” is a leading magazine in the Taiwan direct sales industry. Based on an article in “Direct Sales Century” in 2017, sales through direct selling in Taiwan has increased by 0.57% despite hardships within and outside of the country. Atomy in particular has grown by more than 30% in sales during 2017 and has become one of the top 10 companies in the Taiwan direct sales industry within 3 years of opening. An excerpt from the article featured in “Direct Sales Century” magazine is presented below. Sales through direct selling in Taiwan have been continuously growing for the last 9 years from 2009 to 2017. In 2017, Taiwan’s direct sales totaled 88.6 billion TWD (2.88 billion USD), showing a growth of 0.57% compared to 88.1 billion TWD (2.87 billion USD) in 2016. Although the total sales volume through direct selling hit record highs for both years, the annual growth rate was disappointing. However, the low growth rate was understandable considering that many other industries were also negatively affected by e-commerce growth, a worsening economic environment, and a lower consumer index due to reduced wages. 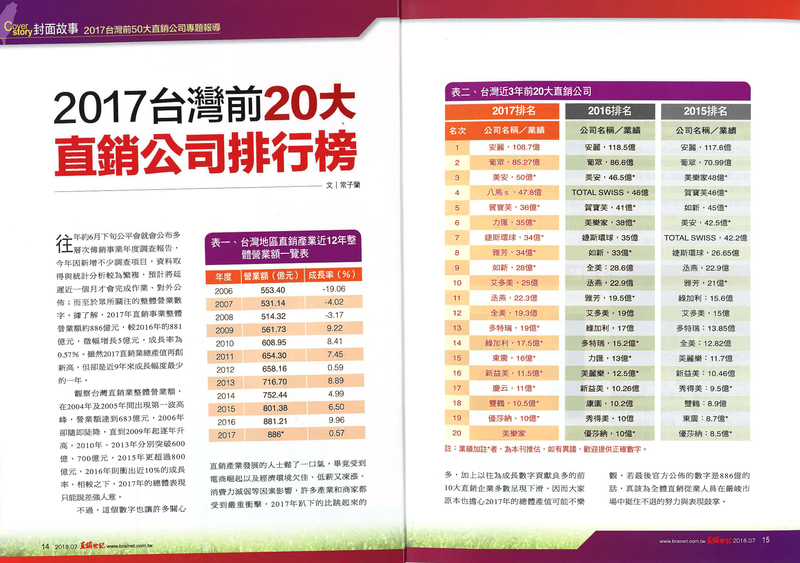 Seven of the top 10 direct sales companies in Taiwan are foreign companies including Amway, Market America, Herbalife, Jeunesse, Arbonne, Nu Skin, and Atomy. The No. 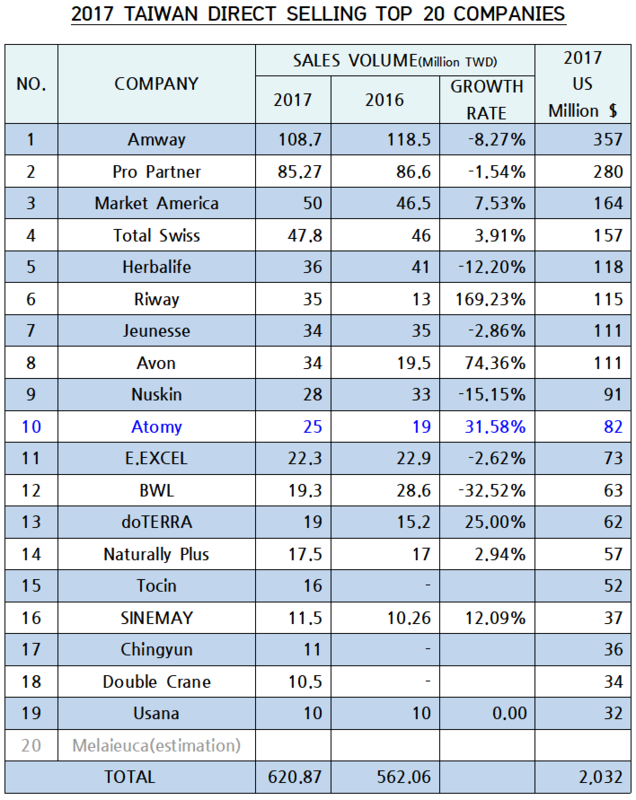 1 company in 2017 was Amway which recorded annual sales of 10.87 billion TWD (354 million USD), but they experienced an 8.27% decrease in sales compared with the previous year. Pro-Partner, a Taiwanese company, was ranked No. 2 with total sales of 8.527 billion TWD (277 million USD), which also showed a negative year-on-year growth rate of 1.54%. Atomy was ranked No.10 with annual gross sales of 2.5 billion TWD (81.3 million USD), recording a significant increase in sales by a rate of 31.58% compared to the year before. Atomy Taiwan, which launched in 2014, has adopted Atomy’s core strategy of providing high quality products at affordable prices with a goal of growing into a global distribution hub. Since its opening in 2014, Atomy Taiwan continues to show a rapid growth rate, and has joined the top 10 direct sales companies in Taiwan within just 3 years. Atomy’s most well-known product, HemoHim (made from Angelica Gigas, Cnidium Officinale, and Paeonia Japonica) comprises 20% of its total sales.